Scooper - Technology News: Where will climate change impact China most? As the world’s largest infrastructure investor, China has a lot to lose when it comes to climate change. The 2015 Paris Agreement on climate requires adaptations that must be planned for and implemented. Rapid urbanisation means that many of China’s infrastructure networks ­– among the world’s largest – are increasingly vulnerable to natural disasters such as flooding and drought, to which China is historically prone. 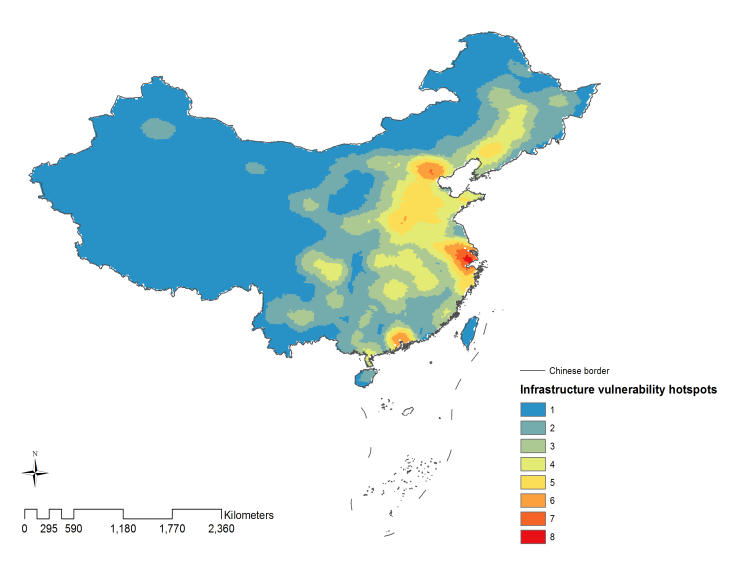 New research from the Environmental Change Institute at the University of Oxford has identified China’s infrastructure hotspots – the geographical regions most vulnerable to serious economic impact from climate change. “Infrastructure criticality hotspot” is defined as a geographical location where there is a concentration of critical infrastructure, measured according to the number of customers directly or indirectly dependent upon it. Red spots indicate high numbers of infrastructure users, so a large number of people and businesses would be affected if any aspect of the infrastructure were to fail as a result of a natural disaster. These hotspots are vulnerable because they are located in areas where there is a concentration of infrastructure assets such as power plants, transport systems (air, rail, road) and water treatment centres – in other words, essential services to a large number of companies and individual customers. If you live in one of the “infrastructure hotspots”, you are more likely to experience the breakdown of one or more of these services because of natural disasters exacerbated by climate change. This could mean more frequent power failures, transport delays/cancellations and intermittent water supply. The prices of electricity, gas and water could rise and you might not be able to travel as freely. For companies, there could be production losses, damage to property and/or industrial accidents on a scale never seen before. The well-documented impact of flooding in Thailand in 2011, when manufacturing plants such as Toyota and Honda were forced to halt production for months, provides a graphic illustration of what could happen in China. Thailand’s losses caused ripple effects in other countries and sectors as well. The costs represented 80% of the world's total economic losses that year and the insurance industry responded by raising rates in some areas by between 50–200% and by not accepting new clients in Asia . In the case of China, the impacts on businesses are potentially astronomical given the scale of its manufacturing production (30% of its GDP in 2010) and its role in the global supply chain. Already in some of the more economically developed coastal provinces, flooding costs, for instance, at city and industrial levels, account for more than 60% of the total flooding costs . The Oxford study finds that the average number of infrastructure (rail, aviation, shipping and water) users whose services could be disrupted by the impacts of flooding stands at 103 million. Drought, on the other hand, whereby a lack of water supply may result in suspension of energy production, could affect an average 6 million electricity users. Individual users can do little in the face of this threat. Companies, however, can take measures. They could commission risk assessments that analyse the types of climate change risks (e.g. extreme weather events) they face and develop plans that mitigate these risks. This is important for manufacturing, agricultural and natural resource extraction companies, which are especially prone to climate change impacts. Even those industries such as banking and finance, which are not necessarily directly impacted, would benefit from such an assessment, as they may have invested in assets in vulnerable sectors. But clearly it is the government that faces the greatest challenge, as they are the biggest infrastructure owners and operators in China. Infrastructure growth has been the key driver in China’s growth. Capital accumulation – a huge part of which is infrastructure investment – has contributed approximately 70% to growth since 1952 . However, a lack of infrastructure that is capable of withstanding natural disasters has nonetheless hindered China’s growth and development. The 2011 floods alone, for example, resulted in the interruption of services to 28 rail links, 21,961 roads and 49 airports, and the failure of 8,516 electricity transmission lines . The good news is that the Chinese government is confronting the potential risks involved. In its first-ever National Climate Change Adaptation Plan, China called for infrastructure to be prioritised. This includes the improvement of disaster risk warning systems, the introduction of higher engineering standards for new infrastructure and the requirement for comprehensive climate risk assessments. Given that infrastructure development will remain a top priority for China’s government in the future and climate change is projected to aggravate the impacts of natural disasters, understanding the exposure and vulnerability of these assets is crucial. It requires the modelling of climate hazards (i.e. how the distribution and frequency of natural hazards will change in the future) and proper assessments of infrastructure vulnerability/capacity, engineering standards to withstand disasters, the number of customers served and how infrastructure is interconnected, so that if one service goes down, others are affected as little as possible. The hotspot analysis presented here focuses on assessing infrastructure exposure and vulnerability. It demonstrates the areas of priority for the Chinese government in protecting its vital infrastructure networks. To deepen understanding of how climate change will affect the Chinese infrastructure system and hence its economy, climate change models need to be added. However, as it stands, the Oxford analysis is the first national study to look at infrastructure exposure in a systematic manner and it is already useful for informing strategic infrastructure planning.